By Steven Lin - Sports Editor · January 18th, 2019 at 3:51 p.m. Returning point guard, Hafith Moallin, gives the Heat the push they need. Last weekend, on January 11 and 12, the Heat fell to the Regina Cougars with a final score of 53-92 on Friday and 77-82 on Saturday. “The biggest thing for us is to look at being a good rebounding team and creating easy scoring opportunities for us,” said Head Coach Olynyk, in response to how the Heat should prepare for the remaining games. From the weekend series against the Cougars, the Heat displayed a lack in the tenacity of rebounds as the rival Cougars scored 10+ rebounds than the Heat in both games. Unfortunately, the low numbers of total rebound in the second half season decreased the Heat’s scoring capability. The Heat averages 70 points per game currently, but from the first four games of the second half season, the Heat only averaged 57 points. Another reason that influenced the Heat’s low score was the missing point guard, Hafith Moallin, due to his injury. However, the return of the starting point on Saturday has greatly increased the general offence capability. 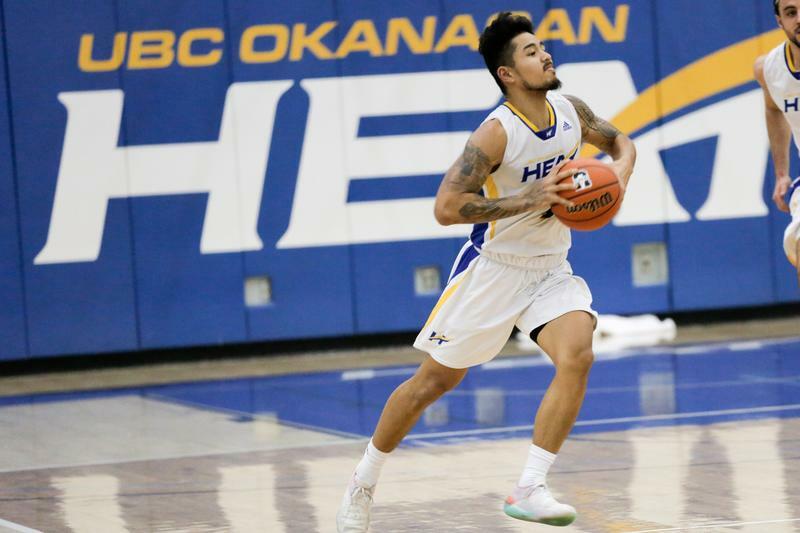 Despite the loss in Regina the returning point guard, displayed a prominent performance of 21 points in his first game as a starter since his wrist injury in November. On Saturday, guard Triston Matthews generated a double-double with a team high of 28 points and 13 rebounds. Moallin contributed 21 points, while making five threes in his nine attempts. Heat captain, Aldrich Berrios, scored 17 points and grabbed five rebounds for the team. “We want to prepare to play these last games with a very strong focus on being a team and working together, with the goal of making the playoffs,” said Coach Olynyk. The Heat are currently standing in the 14 positions (5-11) in the Canada West Conference. The team will be finishing the remaining games against the MacEwan Griffins (0-14) and Victoria Vikes (6-8) in their home gymnasium. On January 18 and 19, the Heat will start off their first home game of the second half season by playing the Griffins at 8 PM on Friday and 7 PM on Saturday. Come cheer for the Heat’s final push for playoffs!